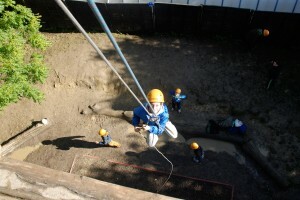 TrekCo offers your group an amazing outdoor activity experience at our centre near East Grinstead in Sussex. 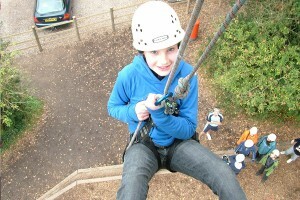 Many activities are at Blackland Farm where we have climbing wall, abseiling, high ropes and much more – just down the lane is Weirwood Reservoir where we run canoeing and kayaking for all ages; and adjacent is Deers Leap Park – our own 230 acre mountain bike park with its own archery, pond dipping, bushcraft and a fleet of 70 mountain bikes for hire! 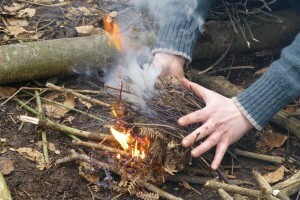 Bushcraft covers a lot of different things – how to be in the woods and countryside, how to make a fire, build a shelter – or simply having fun doing things that kids don’t now normally get to do! we’ll talk to you about what you want to do in your session and tailor the event to the age of children or students that are taking part. 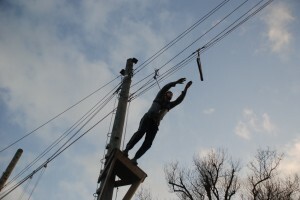 We have endless woods at Deers Leap Park so you can do anything you like! 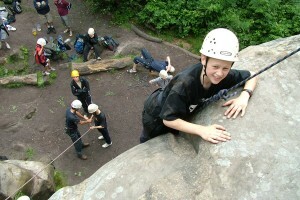 Rock climbing in Sussex offers many possibilities – we aim to give everyone a user friendly, easy introduction to the activity so that everyone can achieve their climb. 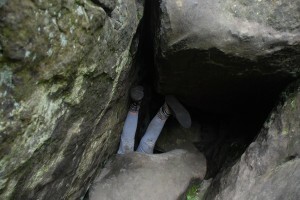 You can progress quickly onto more difficult climbs, or just achieve that personal goal and get to the top. 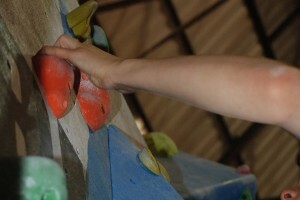 The climbing wall gives everyone the chance to start climbing as easily as they like with the minimum amount of waiting or anything to learn. Start easy and work your way up to harder climbs, or simply get to the top for that great feeling of excitement and achievement! 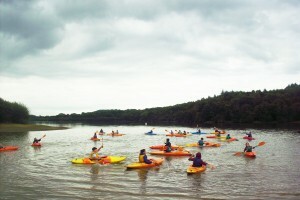 Canoeing (bigger boats) and kayaking (individual boats) are very popular on our school residentials and outdoor activity days. Our fully qualified British Canoe Union instructors will introduce you to the basics of this exciting sport. You get a buoyancy aid and there’s no need to be able to swim as long as you are happy being in the water. We’ll practise in a shallow area where if you fall out, you can just stand up and get back in! Then it’s off for a short trip out into the lake where you can learn a little more. 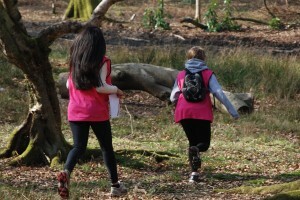 With our dedicated orienteering courses we can run orienteering as a part of an outdoor activity day, a school trip or a residential. Orienteering is good for learning skills, interdependence and working together; and it introduces students to looking at the countryside and nature around them. 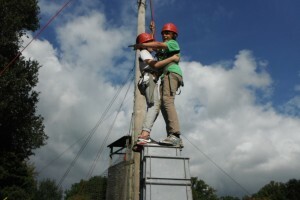 This abseil is actually the highest at Blackland Farm! you have to climb a big tree (belayed by the instructor) to a tiny platform where you will be clipped on for your long abseil to the ground. The tree is also at the top of a slope so it feels even higher! 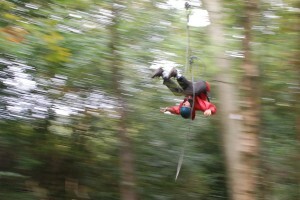 70 metres long, our zipwire takes you on a thrilling ride through the trees at Blackland Farm – this is a great adventure activity definitely not to be missed! On our specialist Archery ranges, learn the basics of how to use a bow safely and get tips on how to fire an arrow where you want it to go. Improve your skills and play some fun games at the same time. Try mountain biking at Deers Leap Park, our own 230 acre mountain bike with fleet of 70 hire nikes just next to Blackland Farm! 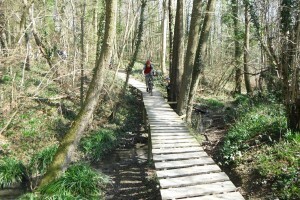 There are trails for everyone and our instructors will take you around the best bits for the ride of your life! Problem solving can be many things – classically it’s the ‘planks and barrels’ type of task but we’ve been inventive and come up with a whole range of tasks to suit everyone. As a part of your school trip, residentials or party booking you can take part in a team building problem solving session which will involve everything from ‘get out of here using this Fairy Liquid Bottle’ to ‘Defuse this Bomb using string and a hosepipe’. 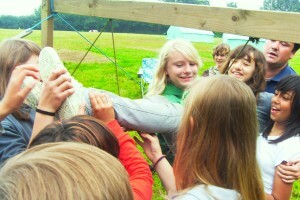 Everyone has to work together and co-operate and often get wet in the process! 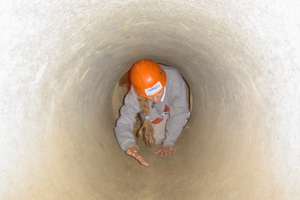 The purpose built tunnel system provides a completely safe way to have a genuine underground caving-type experience! The network of tunnels is big enough for anyone to get through, and complicated enough to get lost. 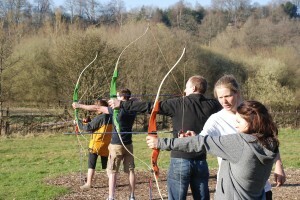 Your instructor will set you challenges and games to make this a fun packed and highly popular session. Build up the crates with two people helping each other until..they fall over! See how high you can make your stack of crates. They wobble..